Keronte Walker intercepts ASU’s final pass attempt in the endzone preserving the Tigers 24-20 win. Courtesy MU Athletics. Mizzou safety Keronte Walker was named this week’s SEC Defensive Player of the Week. 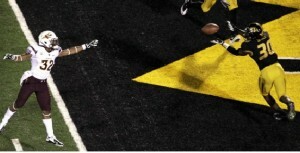 Walker made two plays at the goal line late in the game to preserve Missouri’s 24-20 win over Arizona State. With 3:36 left in the 4th quarter and on a 4th-and-goal for Arizona State at the MU 3-yardline, Walker deflected a Sun Devil pass to stop a potential ASU scoring drive. On its next defensive stand, with 1:58 left in the game, Walker intercepted a Sun Devil pass on a 3rd-and-9 play in the endzone, and returned it 49 yards to seal the Tiger victory. Walker ended the game with two tackles with an interception and pass deflection. Jadeveon Clowney of South Carolina was the SEC’s defensive lineman of the week. Mizzou’s inexperienced offensive line will have to contend with Clowney who was credited with seven tackles, including 3.5 for losses for minus 17 yards with two sacks, in South Carolina’s 49-6 win over UAB. The Gamecock defense held the Blazers to just 89 second-half yards and just 27 rushing yards on 42 carries. South Carolina’s defense sacked UAB quarterbacks six times in the contest. Only four of UAB’s 15 offensive drvies were more than six plays with the Gamecock defense holding UAB to five three-downs-and-out. Six SEC schools are ranked in the top 14 of this week’s coaches poll. Mizzou will play their first road game at #8 South Carolina. The Gamecocks are ranked 7th in this week’s AP.